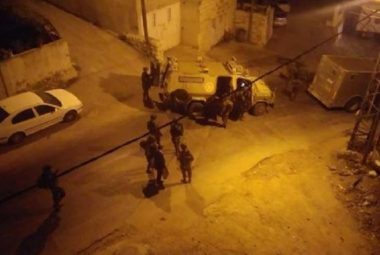 Israeli soldiers invaded, on Saturday at dawn, the town of Ethna, west of Hebron in the southern part of the occupied West Bank, searched homes and abducted three young Palestinian men. Media sources in Hebron said the soldiers stormed and ransacked many homes, before abducting Moath Ahmad Farajallah, 22, his brother Ward, 18, and Mohammad Ahmad Farajallah, 25. The soldiers also interrogated many Palestinians in their homes, while inspecting their ID cards, and violently searching their homes. In addition, the soldiers installed roadblocks at the main roads leading to Sa’ir and Halhoul towns, in addition to Hebron’s northern road, before stopping and searching dozens of cards, and questioned many Palestinians.